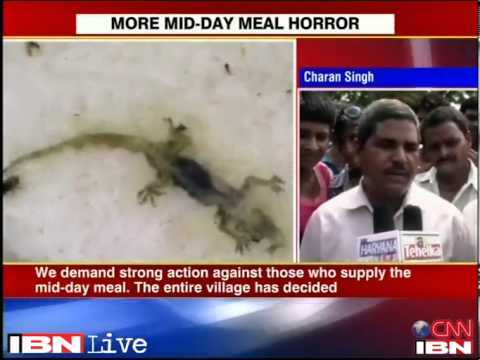 HINDUSTAN TIMES: A day after a dead lizard was found in a mid-day meal in a Palwal school, the ISKCON trust, which supplies food to schools of the area, alleged sabotage. Stating that it had been implementing mid-day meal projects in Palwal district for the past three years, the ISKCON Food Relief Foundation said: "Our centralized kitchen at Dhaulagarh is equipped with the best cooking and pest-control technologies. The incident at Lohagarh seems to be a case of sabotage. Fifty schools had been supplied with food and none of them called us for any complaints,” a statement issued by the organisation said. "We have requested the administration to conduct an enquiry into the matter so that the truth can come out soon," it said. The trust said it had supplied the mid-day meal to 80,000 children in various schools in the district.